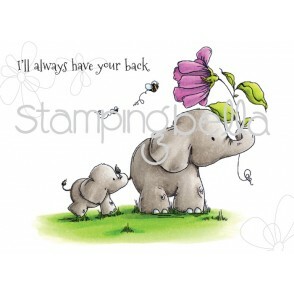 I’ll always have your back…what a great stamp from Stamping Bella! Once again, I used my Copic markers to color this great image. I used My Favorite Things Radial Stitched Circles to cut the image out and then mounted it on Classic Scalloped Circles from Spellbinders. Once again I used one of my favorite dies, Stitched Squares from Lawn Fawn to cut my patterned paper. The sentiment is from a stamp set that I have had for awhile from Lily of the Valley. Some sequins from Simon Says Stamp and some pearls from Martha Stewart and my card front was complete. After adding the message to the inside of the card, I thought it needed something else. I had colored the image a second time so I cut it out and adhered it to the inside of the card. My card was now complete. Adorable. I can see why you love that stamp. Fabulous as ever!